After you see how crazy-easy it is to make pizzafied pancakes, you’ll throw maple syrup to the wind and reach for the pepperoni instead! Pancakes aren’t just for breakfast anymore. 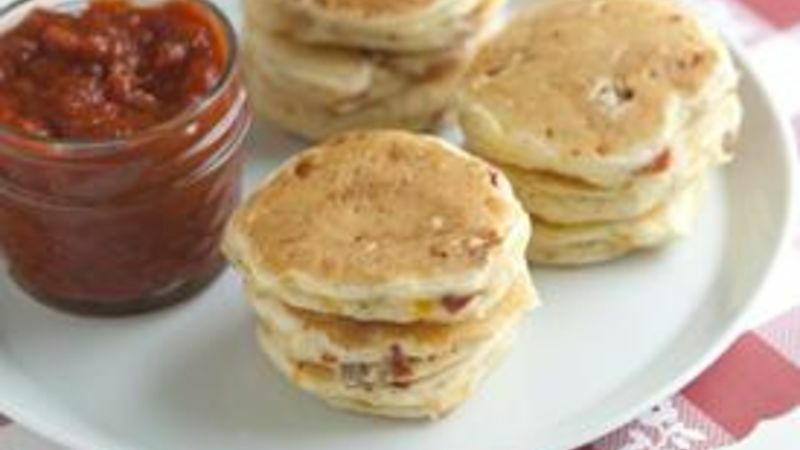 Make these Mini Pizza Pancakes with your absolute fave pizza toppings and serve ‘em warm with delish pizza sauce for dipping on the side. Let’s just get to it shall we? Here’s whatcha need: Bisquick, milk, eggs, Italian seasoning, salt and the good stuff: pepperoni and cheese! Throw in some eggs, milk and then pizza-fy it with Italian seasoning and a touch of salt. This is where the pizza lovin’ comes in … in goes lots of cheese and pepperoni! OR, add in your fave toppings like green peppers, onions, olives, mushrooms, sausage or whatever you like! Cook ’em up: Use a tablespoon to add the batter to a hot greased griddle or non-stick pan. They’ll be done in a flash! Then, heat up some delish pizza or pasta sauce … we love, love, love the organic pasta sauce from Muir Glen. ….aaaand you’re done! Easy. Nibble away. Adam and Joanne think that once you’re finished nibbling your way through a plate of these pizza pancakes, you’ll definitely want more. For more inspiration, visit them at their blog Inspired Taste and their Tablespoon profile.